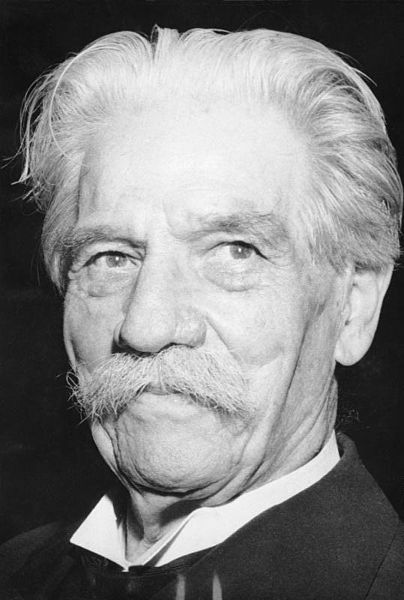 Albert Schweitzer, (14 January 1875 – 4 September 1965) was a German and then French theologian, organist, philosopher, physician, and medical missionary. He was born in Kaysersberg in the province of Alsace-Lorraine, at that time part of the German Empire. Schweitzer, a Lutheran, challenged both the secular view of Jesus as depicted by historical-critical methodology current at his time in certain academic circles, as well as the traditional Christian view. He depicted Jesus as one who believed the end of the world was coming in his own lifetime and believed himself to be a world savior. He received the 1952 Nobel Peace Prize for his philosophy of "Reverence for Life", expressed in many ways, but most famously in founding and sustaining the Albert Schweitzer Hospital in Lambaréné, now in Gabon, west central Africa (then French Equatorial Africa). His "Reverence for Life" principle was also a precursor to modern biocentrism (ethics). As a music scholar and organist, Schweitzer studied the music of German composer Johann Sebastian Bach and influenced the Organ reform movement (Orgelbewegung).